Helical MC7 Series Flexible Stainless Steel Couplings provide you with a full range of torque capacities and bore sizes, all with a .030in parallel offset. Helical MC7 Series Flexible Stainless Steel Couplings attach to shafts with a set screw attachment method. Helical MC7 Series Flexible Stainless Steel Couplings are tailor-made for a wide range of applications. Helical MC7 Series Flexible Stainless Steel Couplings feature industrial motor shaft couplings and a large parallel misalignment capacity. Helical MC7 Series Flexible Stainless Steel Couplings also feature a high torque capacity and large shaft diameters. 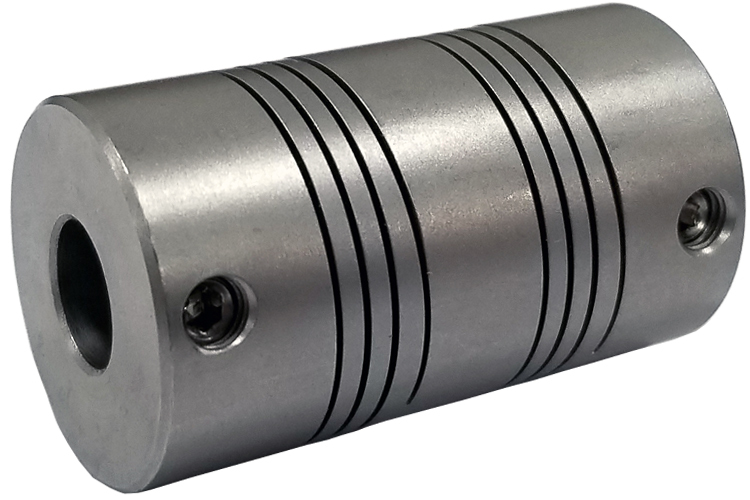 Helical MC7 Series Flexible Stainless Steel Couplings are designed for encoder/resolver applications, moderate torque pumps, lead screws, and various other applications. Anywhere a rugged, tough, long lasting coupling is needed, Helical MC7 Series Flexible Stainless Steel Couplings are perfect for the job. A1 Seating Torque : 65lb/in. A1 Hex Wrench Size: 3/16in. A1 Center Line (Inch): .20in. A2 Center Line (inch): .20in. Torsional Rate: 0.062 degree/lb in. The Helical MC7125-12-12 Flexible Stainless Steel Coupling, MC7 Series is one of thousands of quality tooling products available from MRO Tools. Please browse Helical Flexible Stainless Steel Set Screw Couplings, MC7 Series for tools similar to the Helical MC7125-12-12 Flexible Stainless Steel Coupling, MC7 Series. Helical MC7125-12-12 Flexible Stainless Steel Coupling, MC7 Series description summary: Helical Flexible Stainless Steel Couplings, MC7 Series. Outside Diameter: 1.25'' Length: 2.37'' Major Bore Diameter: 0.375'' Minor Bore Diameter: 0.375'' Momentary Dynamic Torque: 91 lb/in. Angular Misalignment: 5 deg Parallel Offset: .030'' Quantity discounts may be available for the Helical MC7125-12-12 Flexible Stainless Steel Coupling, MC7 Series. Please contact MRO Tools for details.